Who would have thought that a storybook about a mother's love for her child could be used for a forest theme? Well, I guess that when the book is about a little raccoon and his raccoon mother, it fits perfectly. I am so happy to share this book with you...it's the kind of book which makes you feel happy inside when you read it. The beautiful story surrounds the room with warmth and reassurance. It answers a question little ones may wonder about. When does their mother love them most? 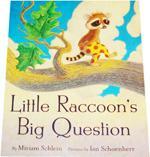 The little raccoon in the story tries to guess. Is it when he eats neatly, when he plays in the trees, when he swims well, or when he goes to sleep? I am not one who likes to give away the end of a story but I am sure that all the mothers out there have already guessed the true response. Of course, there is no specific time, it is all the time. Isn't that a nice thing for children to know?